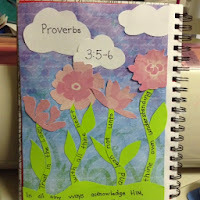 This week's Scripture Journal entry is on Proverbs 3:5. 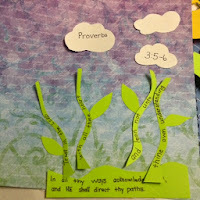 I went ahead and included the next verse because I can't hear verse 5 without including 6 in my head. 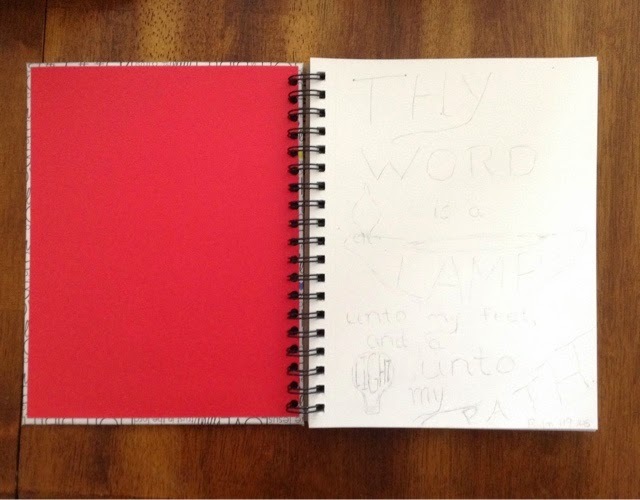 I've also found it interesting that so far I've used the KJV both weeks in my journal. 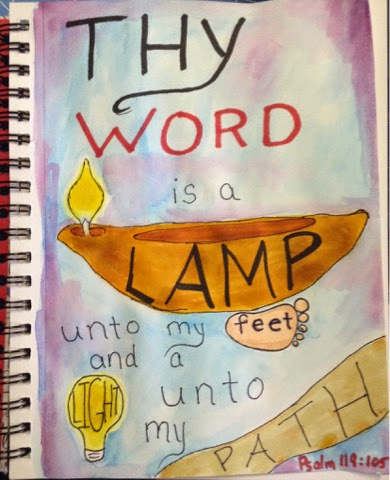 These verses are very familiar to me, they were ones I learned in my childhood back when most people used the King James Bible, and that version still seems better or more poetic for certain verses. I'm sure I will use ESV when we get to less familiar verses. 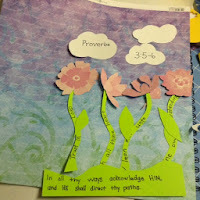 I wasn't really sure what I wanted to do for this verse. It wasn't as obvious as last week's. I started with the idea of flowers. 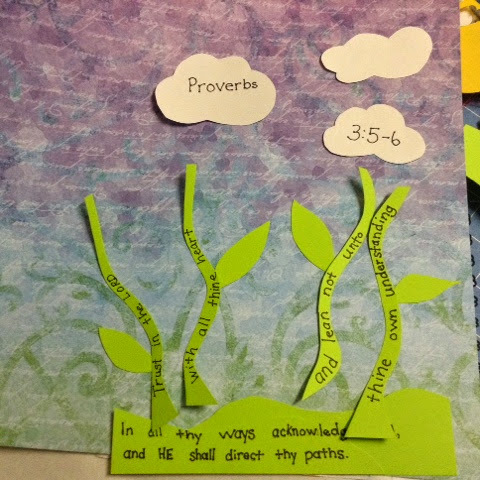 I decided to use the flower stems for the verse and put verse 6 on the ground. 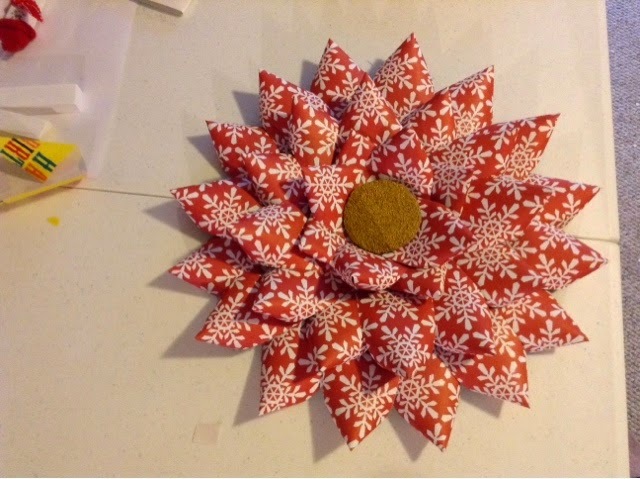 The flowers are cut from a piece of patterned paper. One thing that I "allow" myself to do on mixed media is to hand cut and write a lot of it, as opposed to when I make cards most everything is machine cut, stamped, or computer generated. I really enjoy the child-like effect this gives. As you can see I solved the bleed through problem by covering it with paper. And don't look too closely at that background paper or you will see the script is upside-down! 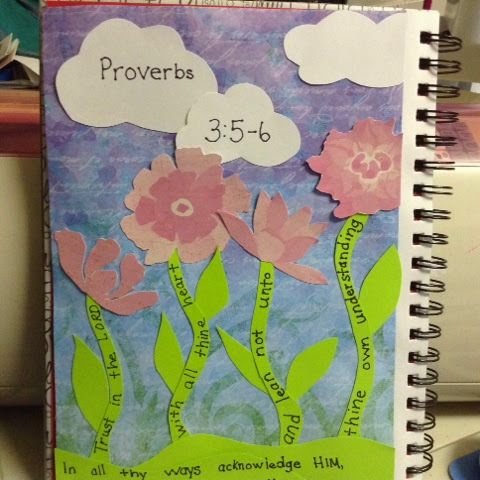 I have decided to start the new year by joining Maymay Made It in creating an art journal to put Bible verses in. She explains it in this video if this is something you might be interested in. 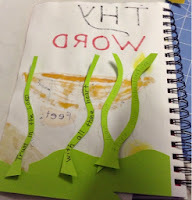 I took the cover off a Canson Mixed Media journal and recovered it, including covering it with clear Con-tact paper. I kept it simple because I wanted to be sure I could keep the cover clean and undamaged. Our first verse is Psalms 119:105. I sketched out my design in pencil, then used alcohol markers and distress inks to color. It isn't exactly what I was picturing in my mind but I enjoyed playing with my toys. I did shimmer up the yellow lights but you can't see it in the photo. 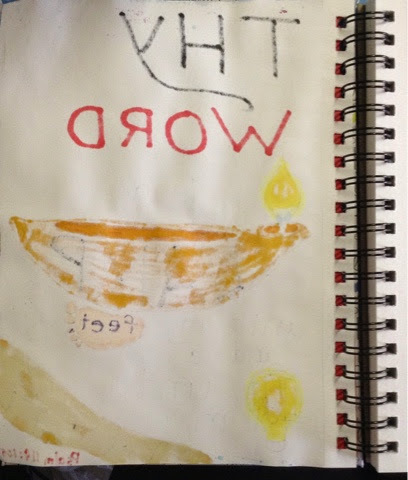 I don't have specific plans for processes or materials to use throughout the book. 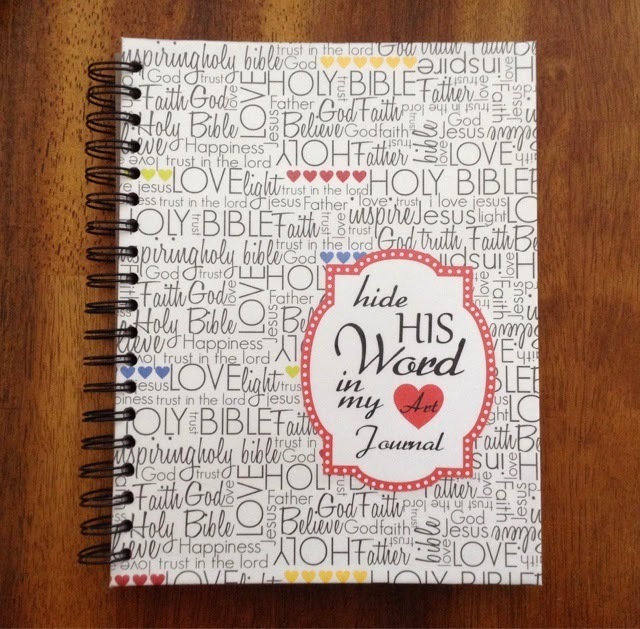 It is first a way to memorize scripture and second a place to create. One thing I'm not sure about is what to do with the back of the pages. 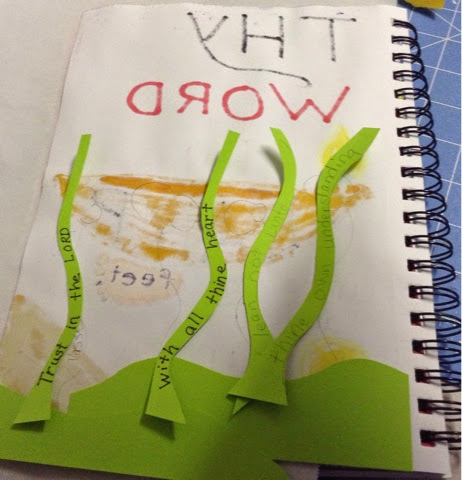 I'm thinking about just gluing the pages together. If you do an art journal what do you do when the front bleeds through? I'm planning on keeping up with this throughout the year and posting regularly. Would love to know if any of you are doing something similar! A couple projects I have been working on to get ready for Christmas. I finished these trees today. 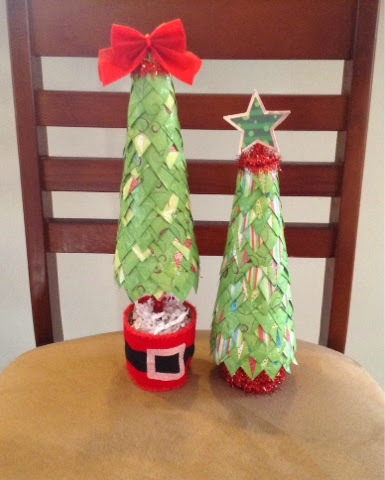 The bases are foam tree forms from the Dollar Tree. Everything else was stuff I already had. 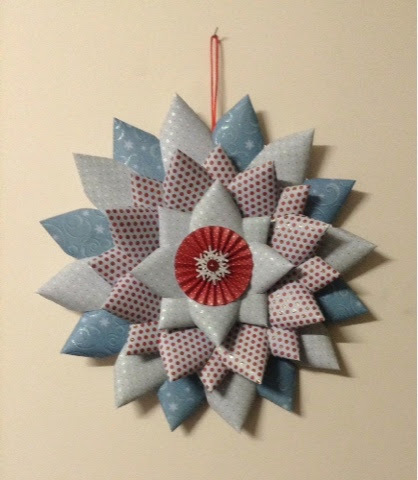 I used paper cut in small triangles and glued on with hot glue. Topped one with a bow and put in a small pot wrapped with ribbon. The stick is a bbq skewer wrapped with tinsel trim. The other is topped with a star sticker. 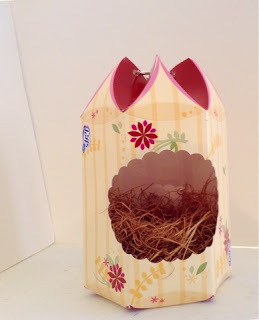 The base is a mini storage cup also wrapped with tinsel trim. 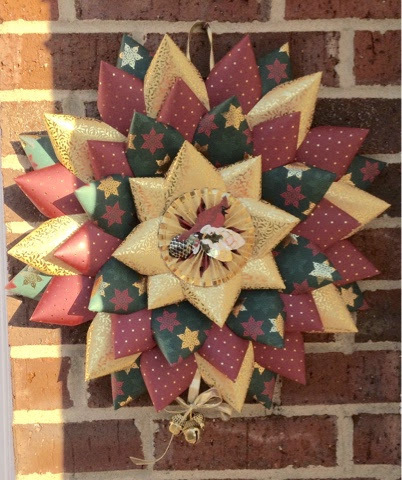 The wreaths are ones I have been making over the past two weeks. I learned how to do this from a video by Sylvia Tabor. Some are gifts, but at least one will be for us. 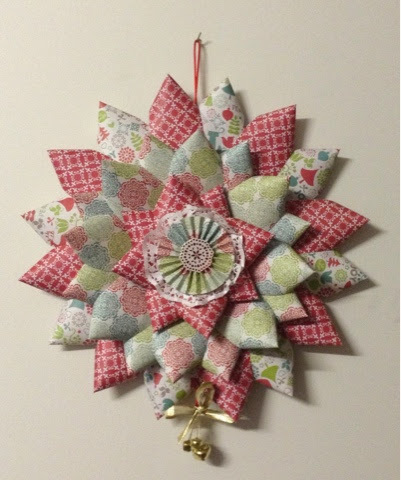 I probably will make at least two more before I decide who gets what. Or maybe I'll just keep them all! The November challenge over at the Kraaft Shaak (a great kommunity over on Google +) is to alter something. 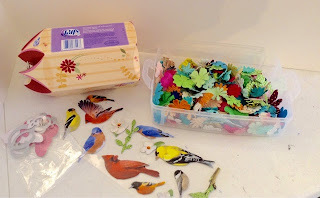 I was sitting in my craft room trying to think of what I could do when I saw this. This has been hanging in my room just like this for at least 2 years. It's a Puffs tissue box. Already quite beautiful, I had pulled the top up to make a hanger for it, stuck some wood excelsior in it for a nest, then promptly forgot about it. So I decided it was about time to finish this project. This picture shows the back of the box as well as some other items I thought I would use. Here is the side of the box. I needed to cover the logo so I stuck flowers on top. The green flourish started out as silver like the ones you see in the bottom corner. 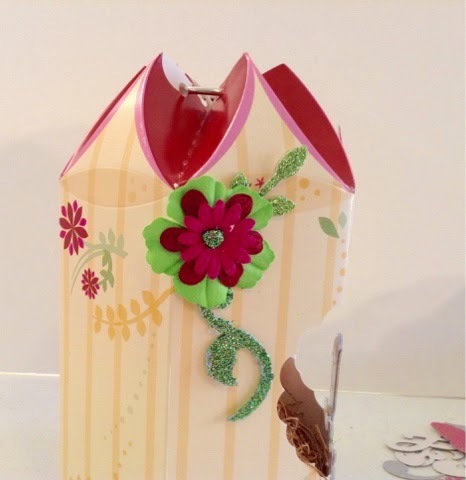 I covered the silver flourish with green glitter to make it match the box. Can you see the mistake I made here? There is a lump of hot glue where I had originally put the outer bird. When I put the branch on I decided I would rather have the bird perched on the branch. Here you can see the completed project. 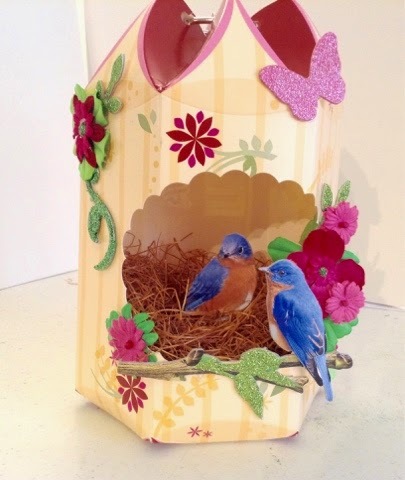 I have glued some more flowers on the box to cover that hot glue mess. I really like the way this turned out, and that it was pretty enough that I didn't need to add too much to make it look great! 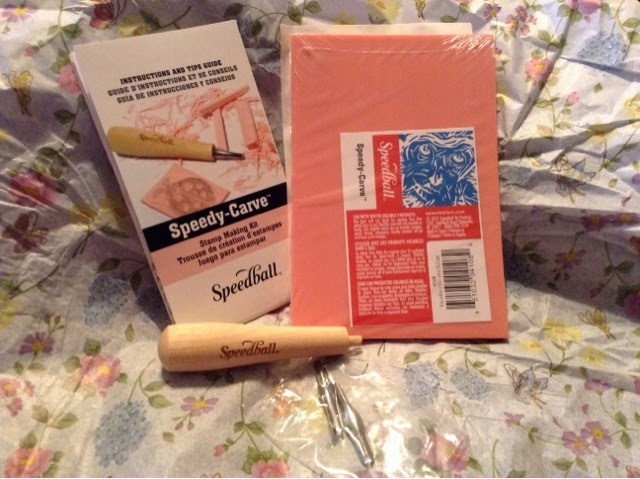 This past week I won a stamp carving kit from Heather over at the Kraaft Shaak. 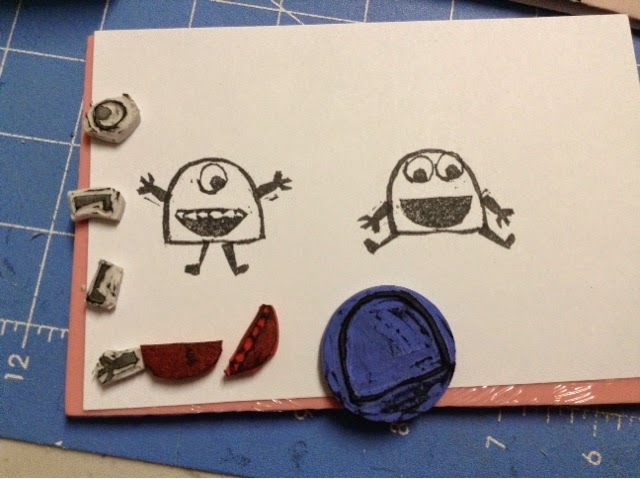 I had to start playing today but I was afraid to cut into the stamp material and mess it up. 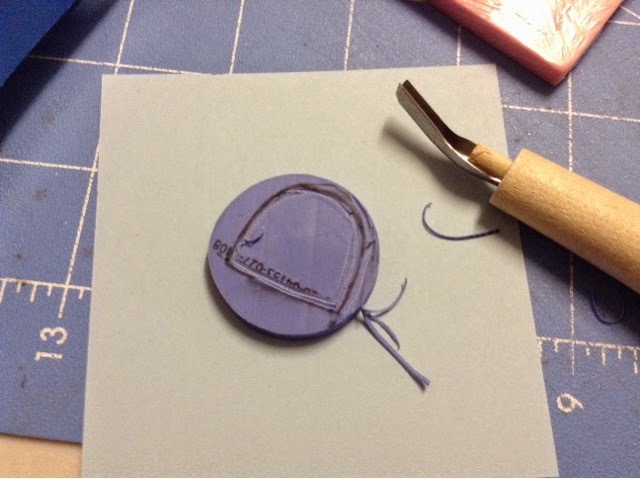 Fortunately, during the weekly live show Sandra (go visit her - she's doing a week long stamp carving series!) 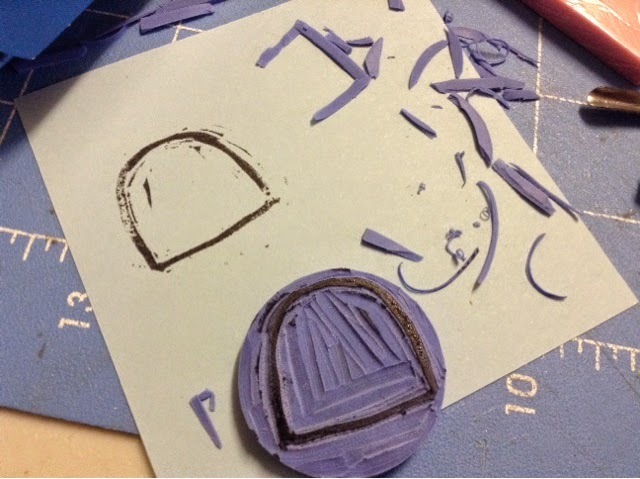 showed that you can also use erasers to carve. Off to the dollar store I went! I started with a simple shape on some small round erasers. I had drawn some candy monsters earlier this week based on Marie Browning's post on the Tombow Blog that seemed simple. The biggest problem was how small the parts were. I wanted this to be flexible and interchangeable, so I did all the body parts separately. ﻿﻿I enjoyed doing these a lot. I know I need to refine my skills but I was pretty happy with my first time ever stamp carving. Special thanks to Heather, Sandra, Tina, and Marie for the products, information, and inspiration. The Word of Inspiration this past Wednesday was "Time"
Please ignore how crooked I glued this! I used this as a reason to cut a cuckoo clock file I've had for a couple years. I wanted it to be a real clock though. 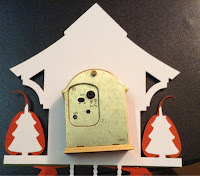 I remembered a clock we received as a wedding gift that I hadn't used in years. 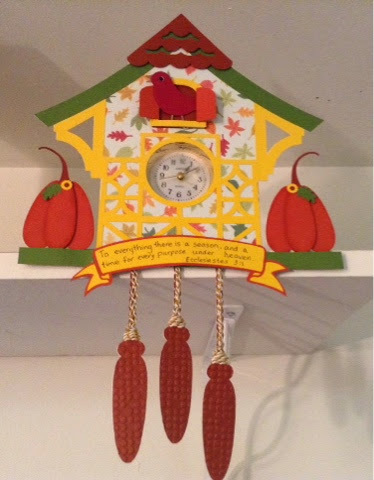 I sized the cuckoo clock to match the real clock face. 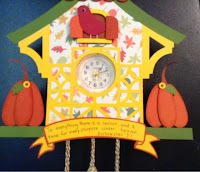 I decided to make this an autumn themed clock and chose papers to match. The original file had pine trees that I decided to make pumpkins instead, to match the theme better. 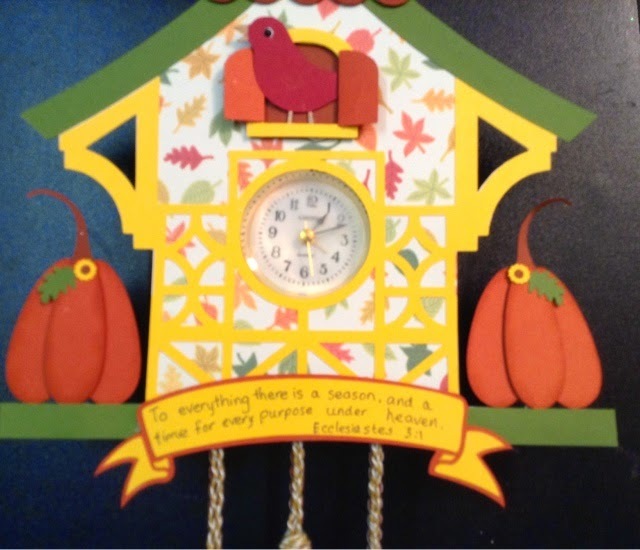 I added the banner with the quote from Ecclesiastes to complete the clock. I liked that it tied in both the thought of seasons and time. For a very special birthday girl! 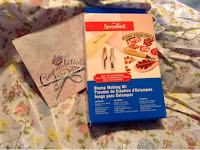 This is a gift for a special 4 year old. The tutu is made of 1" elastic, tulle and ribbon in coral and teal. I cut the elastic at about 22", overlapped an inch and sewed. This is the only sewing in the project. 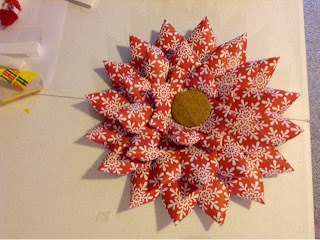 The tulle and ribbon were cut to 24", then folded in half and wrapped around the elastic. 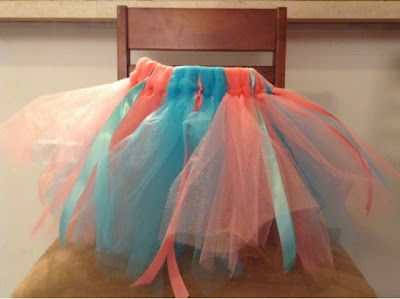 I followed instructions I found on YouTube by searching for "tutu tutorial." 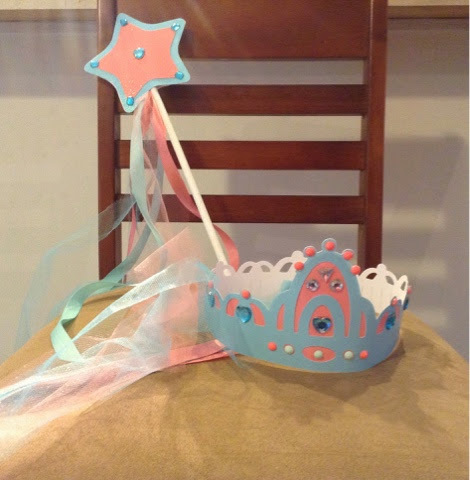 The wand and crown were made using the Cricut cartridge Once Upon a Princess. I used glitter cardstock and bling from my stash that matched the tutu as closely as possible. I also painted a 12" dowel white then covered it in glitter glue to make the wand handle. 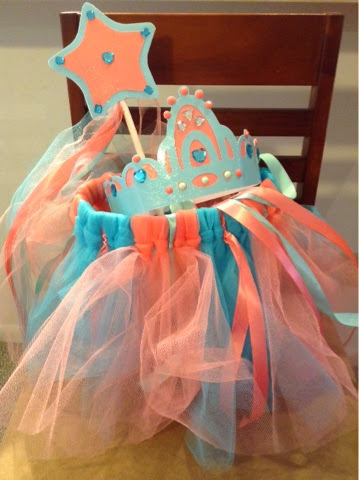 I added tulle and ribbon to both the crown and wand. Here is the set together. Happy Birthday Elizabeth! 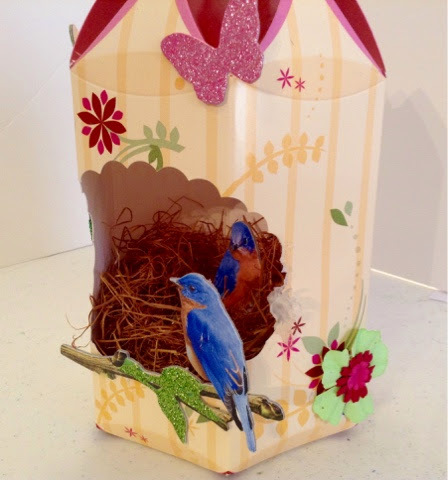 Scrapbooks, Crafts, and Cards, Oh My!